Do it yourself projects, room reveals, new product reviews, holiday decorating ideas, and some handy tips can all be found each week in the Tutes & Tips Not to Miss round-up. It’s like a mini-magazine weekly delivered to you for free! I hope you enjoy the features I have hand selected for you this week. Thanks to everyone for sharing your amazing gifts and talents with us each week! Entryway Makeover by The Painted Hive. 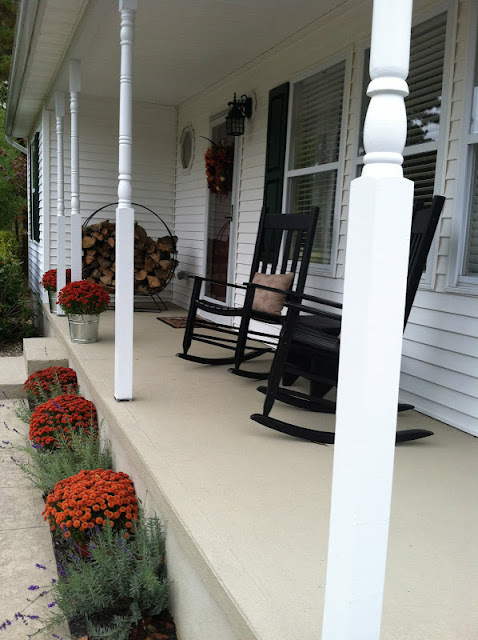 I have featured the “before” of her entryway numerous times over the past two years and the “after” is just as lovely! 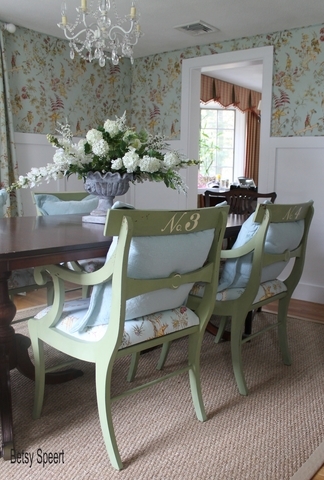 Cottage Dining Room Reveal by Betsy Speert. Betsy always delivers a gorgeous room reveal! 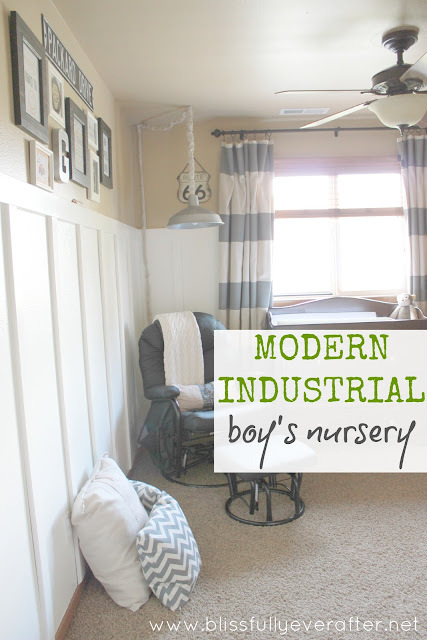 Boy’s Nursery Reveal by Blissfully Ever After. A lot of good DIY projects went into the making of this nursery. Be sure to check out how she created all of her art. Moody Blue Powder Room Reveal by Evolution of Style. 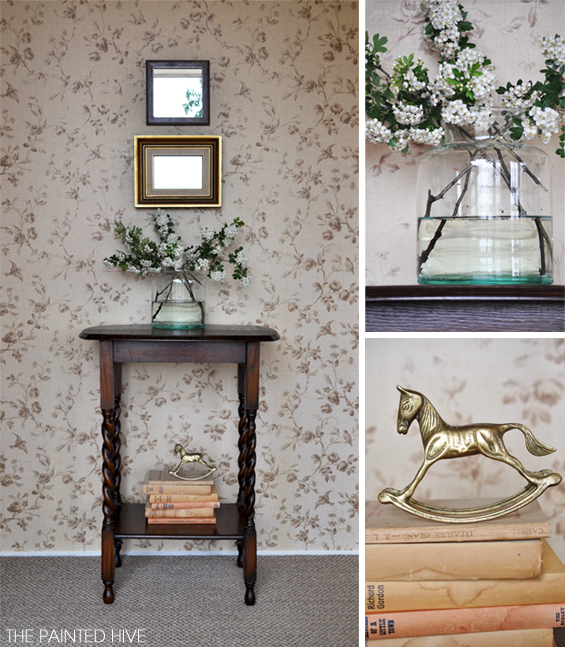 A gallery wall in the powder room is a brilliant idea! How to Build Front Facing Bookshelves by Grown from Scratch. My kiddos love their books facing forward. Learn how to create your own bookshelves with this tutorial. How to Restore Concrete by Pine Tree Home. Loved this post! We have some concrete steps that I thought we’d need to smash and just start over. This post gives me hope that they are salvageable. How to Install Tile Using Simple Mat by Decor and the Dog. I used the Tile Setting Mat by Simple Mat to install my stone backsplash and highly recommend it. 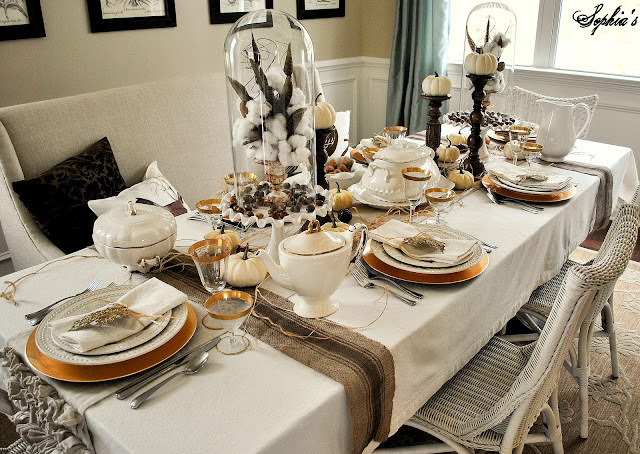 Thanksgiving Table Setting by Sophia’s. 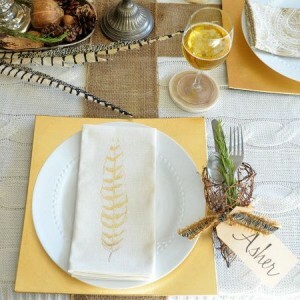 I thought I liked my own metallic and natural Thanksgiving tablescape until I saw this one over at Sophia’s. Absolutely stunning! Free Printable Chalkboard Thanksgiving Placemat by The Creativity Exchange. She offers a Christmas placemat as well. So cute! Driftwood Garland by Burlap & Denim. Amanda confiscated all of this glorious driftwood while on a trip to Hawaii. I love what she’s done with it! 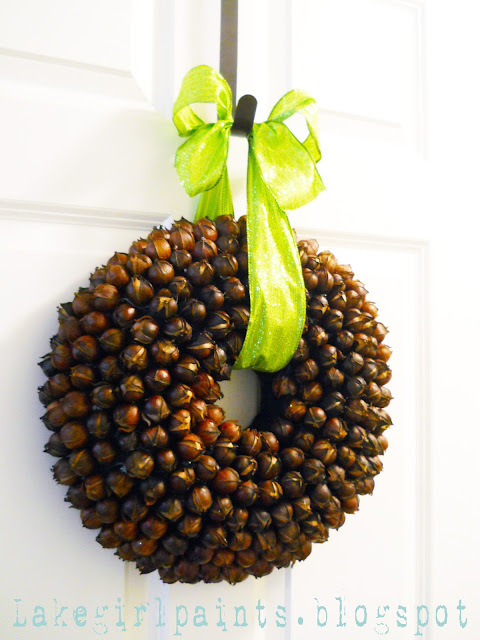 Hickory Nut Wreath by Lake Girl Paints. Go see how she created the wreath form for this wreath! Felt Pine Trees by The Crafted Sparrow. It’s that time of year again! Cover your styrofoam or cereal box cone trees with some felt to make them super cute this season. Fall Kitchen Shelves by Brightly Inspired. Another post for those with mantel envy. No mantels required to create beautiful seasonal vignettes! How to Make Pallet Wall Antler Art by Megan Brooke Handmade. See how she ages new wood with her special recipe. 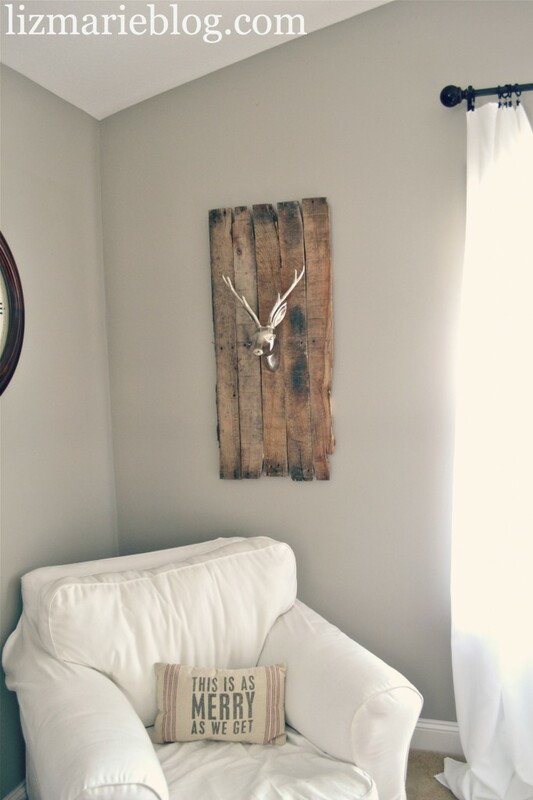 DIY Deer Head Pallet Art by Liz Marie. Proof that in the blogosphere great minds are constantly thinking alike! Chalkboard Frame TV Screen Cover by Minerva’s Garden. This is brilliant! If you’re looking for a way to hide your television, you will want to read this tutorial! 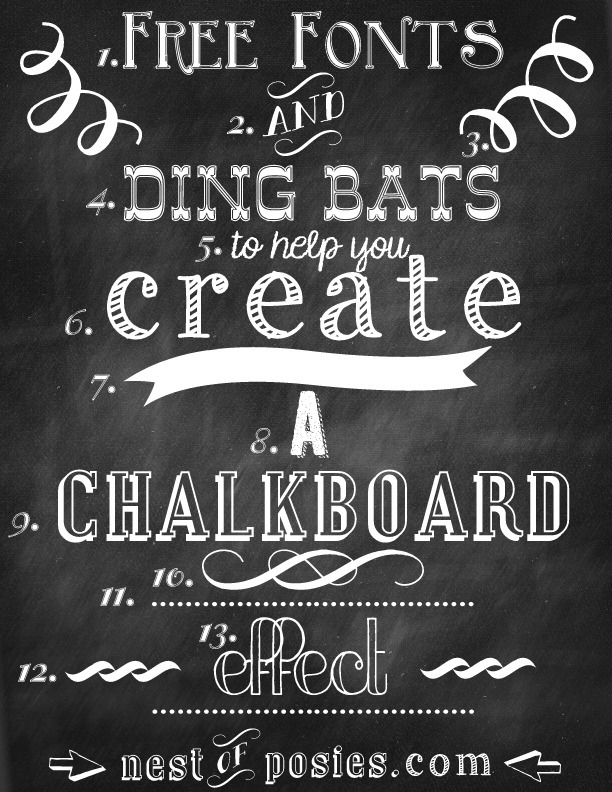 How to Create Chalkboard Effect Fonts Without Photoshop by Nest of Posies. Yay! No photoshop required is what we like to hear! How to Easily Fix Jeans that Gap by Saving 4 Six. I have a few pairs of jeans in need of this quick fix! Thanks again to everyone who linked up and linked back! I’ll see you at the party tonight! you always have such amazing features! Thanks so much for featuring my easy jean fix!! I really appreciate it! Thanks also for hosting your party so faithfully. I love linking up! How exciting to be featured! I always get great ideas and tips from your round up. Thanks for taking the time to do this. I can tell you we’ve had a battering of rain and a freak snow storm here in my woods of NJ and the porch and step is holding up great. Get ready to make over your concrete this Spring. It’s my first time getting one on your blog…..
You’re so welcome Betsy, but you’re wrong girl! I’ve featured you several times before! Here, and here, and here :). Awesome features! I am beyond speechless to be included in this amazing post! Thanks for the feature! You’re welcome Shayna! Thanks for letting me share! Wow!! 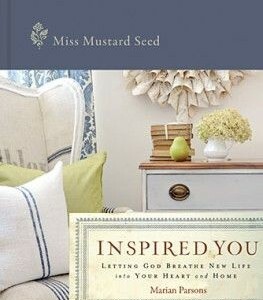 So much amazing inspiration! I love it all and I can’t wait to go visit everyone. Thank you so much Beth for including my little printable chalkboard placemat! Thrilled to be included!! I will see you tonight back at the party! Hi Beth: Thank you so much for featuring our chalkboard tv cover–so glad you liked it! What a gorgeous collection of features. Seeing so many in one place always makes me want to makeover a room!